In Poland, tree cake is known as sękacz (SAYN-kahch) or senkacz, which loosely translated means “bark.” And in very politically incorrect terminology, it’s also known in Poland as “beggar’s cake” supposedly from the days when gypsies stole eggs and made them into a cake because it was more portable on the run than eggs in the shell. Prügeltorte. This cake is mostly common in Austria, particularly in the Tyrolese villages along the River Brandberg . As this very simple recipe goes: work dough till a liquid, yet very viscous consistency, with all ingredients combined at a time. Run slowly dough on spit covered by baking paper. Rotate slowly spit heated from below or from sides. Where dough is solid pour some more. Unbroken layer will probably cover only part of cake surface. Dripping dough will form small bulges on cake crust. 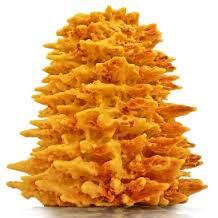 For all royalty conditions at disposal, the Tyrolese have not taken the time to get it patented. 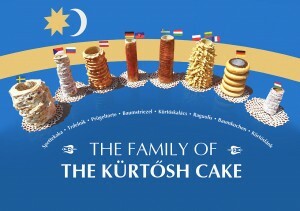 In Germany, it is called baumkuchen, which literally means “tree cake.” The final appearance and taste of the German cake are a little different from the Polish and Lithuanian versions, which are virtually indistinguishable — pyramid-shaped with spiky ends. The technique, however, is the same — pouring successive layers of batter along the length of a rotating wooden pole or stainless-steel rod in front of a heat source. 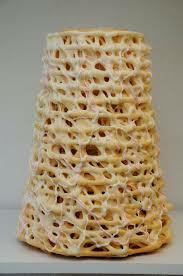 When the hollow cake is cut, it reveals rings similar to a tree trunk, hence its name. Spettekaka or spettkaka (spiddekauga in native Scanian) is a local dessert of the southern parts of Sweden, chiefly in the province of Scania (Skåne) but also in Halland. It is an important part of the Scanian culinary heritage. The name means “cake on a spit”, and this describes the method of preparation: it is the Swedish variation on the spit cake. The Hungarian version — kurtoskalacs — is often served at traditional weddings, but it’s very different from the Polish, Lithuanian and German versions. It is made with a yeast dough that is rolled and cut into strips and then wrapped around tubes (originally it was rolled on a log and turned on a spit over an open fire). Today’s version can be made in a home oven on stainless-steel baking tubes that stand verticallyry. Originally from Transylvania, it is famous as Hungary’s oldest pastry. Kurtoskalács is sold in bakeries, festivals and fairs, and on street corners. 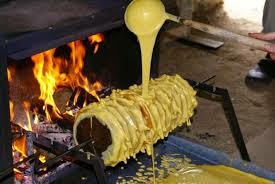 View this video of Hungarian chimney cake making. 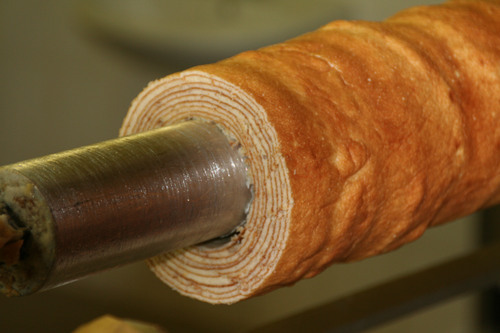 Baumkuchen is one of the most popular pastries in Japan, where it is called baumukūhen(バウムクーヘン? ), or often erroneously, bāmukūhen (バームクーヘン?). It is a popular return present in Japan for wedding guests because of its ring shape. It was first introduced to Japan by the German Karl Joseph Wilhelm Juchheim. Juchheim was in the Chinese city of Tsingtao during World War I and when the war ended the Japanese Army removed him and his wife to Japan. Juchheim started making and selling the traditional confection at a German exhibition in Hiroshima in 1919. Continued success allowed him to move to Yokohama and open a bakery-store, but it was destroyed in the Great Kanto Earthquake of 1923, thus forcing him to move his operations to Kobe, where he stayed until the end of World War II. Some years later, his wife returned to help a Japanese company open a chain of bakeries under the Juchheim name that further helped spread Baumkuchen’s popularity in Japan and is still in operation. I’m not aware of tree cake existing in other European countries, but it certainly may. As to its origins, it’s the same old song and dance — Poles say it began there, Lithuanians say they are the creators, and Germans claim it as their own. To this day, tree cakes are popular on sweets tables at Polish and Lithuanian weddings and for special occasions like Easter, Christmas and birthdays. They are often adorned with fresh flowers and herbs in the hollow top and at the base. Slices are cut off from the top horizontally and then further divided into bite-size pieces. In a concession to modern times, the pieces are often accompanied by fruit and melted chocolate, and presented very elaborately. Luxembourg – known in Luxembourg, called Baamkuch, has become a traditional dish served mostly on special occasions, such as weddings. 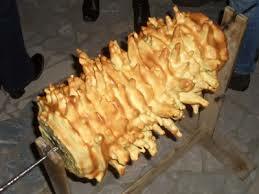 Poland – Sękacz is a similar cake also cooked on a spit, normally over an open fire. Romania – Cozonac secuiesc is a similar cake also cooked on a spit. Hungary – Kürtőskalács same as Cozonac secuiesc.